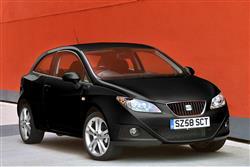 SEAT's Ibiza is a longstanding favourite in the supermini sector. It delivers Volkswagen build quality for less and in fourth generation guise, features distinctive, edgy styling. Beneath the sharp suit is some advanced engineering while perceived quality has been tightened up. The Ibiza supermini we first saw in 2007 was a massively important car for SEAT. Parent company Volkswagen was pushing for a massive increase in the Spanish maker's annual sales at the time and much depended on this crucial model. SEAT's marketing issue was to convince the buying public that here was a supermini that had all the build quality of the VW Polo it was based upon, but which also delivered a bit of extra flair, both from a driving and a design perspective. This, after all, is all that sets an Ibiza apart from the VW Group's other superminis, the Skoda Fabia and the Volkswagen Polo. Hence the importance of sportier Ibiza variants like the SportCoupe (SC) three-door and the Cupra hot hatch. Underneath the Ibiza styling is the core of the car, the small car platform from the Volkswagen Group. The variety of bodystyle alternatives include three and five-door hatch, an ST estate version and the more aggressive three-door Sport Coupe. The car's looks mark it out, with swooping bodywork strakes along the sides, slanting headlights and a busy front end underneath the slight smile that is the SEAT grille. Inside, although the cabin is a quality product, it doesn't really have the same styling impact of the exterior styling. In fact, it's here that the roots of the Volkswagen influence most clearly show through. The dash is quite staid and there is a lot of the grey plastic that drivers of German cars will be familiar with. Basic equipment is good, with the entry-level models featuring everything from a steering wheel that has adjustment for height as well as for reach, a height-adjustable driver's seat, electric front windows, remote central locking and a six-speaker CD system. There's also the AUX input for your iPod in later models, plus the SE version adds electrically adjustable and heated door mirrors, as well as electric rear windows, cruise control, air conditioning and alloy wheels. The Sport adds stiffened sports suspension and sports seats as well as leather interior trim and 16 inch alloy wheels. There's a surprising amount of space inside for four adults and for rear seat passengers especially, who tend to draw the short straw when it comes to head and legroom in cars of this size. Luggage space is good too, with 292-litres of space in the boot of the five-door car and almost as much, 284-litres, in the boot of the three door model. The Ibiza, especially if you can find a car with a proven dealer service history, has a reputation for reliability, not surprising perhaps given its Volkswagen small-car underpinnings. If you're looking for earlier cars, it's better if possible to seek out higher spec models since its only recently that SEAT has addressed the poverty spec initially metered out to entry-level variants when the range was first launched. S and SX trim levels are the ones to go for as these feature air conditioning (or climate control on the SX), twin airbags and a CD player, while SE spec adds ABS and side airbags. What problems there are have been related for the most part to the electricals, though a few Ibizas have reportedly also had some transmission issues. Engine-wise though, this car is pretty bullet-proof. We'd suggest the 1.2-litre petrol unit, exceptionally good on fuel (regularly returning around 50mpg on the combined cycle) as well as able to deliver perky performance. A new radiator is around £45, front brake pads £30, and a clutch kit about £80. An alternator costs around £110 and a starter motor around £110. The Ibiza may not be the obvious choice as a driver's car but for a number of years now, it has drawn praise and plaudits thanks to the composed way in which it handles corners and also thanks to the sharp, reactive steering that gives a lively and entertaining, though never wayward drive. Some may say that the base car's comfortable ride can veer towards the soft, even wallowy, when pushed. A Sport-spec model will resolve that issue. The Sport's uprated suspension is stiffer, to make handling and cornering sharper, but does so without compromising everyday comfort or delivering an over-harsh ride. SEAT is building a healthy reputation in motorsport events, especially saloon car racing, and that success is reflected in more focused sports models such as the FR and Cupra. The engine line-up begins with the highly economical 69bhp 1.2-litre 12-valve petrol engine. There's also the 84bhp 16-valve 1.4 and then the more sporty 1.6-litre petrol, an engine that develops 104bhp, which is enough to take the Ibiza from a standing start to 62mh in 10.5s, with a top speed of 126mph. Depending on your perspective, this 1.6-litre petrol unit will either be seen as noisy when worked hard or as having a focused, sporty rasp: drive and decide yourself. The sportiest Ibiza models are all based around the 1.4-litre petrol engine in TSI format with supercharger and turbocharger which results in the 148bhp FR and 178bhp Cupra. On the diesel side, there's the 1.2-litre ECOmotive common rail 3-cylinder diesel as well as its bigger brother, the 1.6-litre common-rail unit. This latter engine probably offers the best compromise of performance and economy. Fans of faster diesel engines have the choice of the FR TDI with its 2.0-litre 141bhp diesel powerplant. So how to sum up this SEAT Ibiza? Well, the shape seems to hang together well, especially in slick SportCoupe guise. There's also a reassuring commitment to technology and the basics seem to be in place for a decent drive. The interior is a big step forward too from the rather cheap-feeling cabin of this car's predecessor. All of which is just as well for the competition in the supermini market is white hot and a car that is blandly competent across the board isn't going to cut it. Fortunately, this Ibiza has a flair all of its own and is usefully cheaper than the Volkswagen Polo it's based upon. You could just find it a refreshing change from the usual suspects in this sector.